Nico Nico Douga began in 2006 as a site similar to Youtube, a place for people to upload videos themselves. It was only after the interactive component—the scrolling live comments—was added that the popularity of the site began to explode, especially in the anime/manga otaku community. “Every third person in their 20s in Japan is subscribed to this service” now, Spahn explained—20% of the population, or around 24 million people. “And that happened in the past three years.” The interactive portion is drawing not only otaku but a more mainstream audience as well because “it just grabs people, because they want to interact, they want to communicate.” With the rise of interactive social media in general, Nico Nico sees an opening to expand internationally. They certainly made themselves visible during convention season. 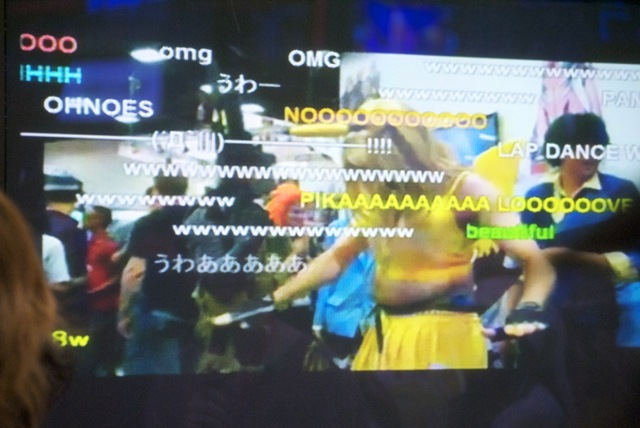 Our first exposure to Nico Nico’s new international ventures actually took place at this year’s Anime Expo. Their film crew sat across from us at the table at the press junket in the morning, awaiting their turn for coverage of the guests. Then there were Nico Nico t-shirts for the service packed in every attendee’s goodie bag. They also ran a large booth in the exhibit hall, not far from Funimation’s booth (they are partners, so it seems), where they were broadcasting live from the conventions, with running captions and all. They repeated the same idea at the Funi booth at Comic Con, as you can see below. Man-kichu, as I call him, got quite a reaction. Even before the English beta was released earlier this year, Spahn said that he ran into much pent-up demand for the service beyond Japan. For instance, a survey of participants at a “Nico Nico 101” tutorial session when the beta first opened revealed that “a third of them already had accounts—they were using Google Translate to get to the Japanese site. So there’s a definite need.” While the beta site does seem less busy than the packed-to-the-gills Japanese parent site, Spahn promises that it will receive an overhaul before it goes live with version 1. But as the live event coverage of both AX and Comic Con suggests, Nico Nico wants to be more than just about MADs. The professional press team went to major news events such as a Presidential speech and the last Space Shuttle landing, indicating a desire to spread beyond just fandom. A Nico Nico Fashion Week, featuring fashion shows from across the world like in Amsterdam, Copenhagen, and the Mercedes-Benz Fashion Week in New York (yes, such a thing exists), is forthcoming—something one might not necessarily associate with otaku. But this is more familiar to us. A Nico Nico anchor interviews a Honey-kun cosplayer. And it’s not just professional broadcast—the beta already allows for users to do their own broadcasting too, similar to Ustream but with the Nico Nico comments. “We enabled user broadcasting a couple of weeks ago, and there’s always someone broadcasting…then you always come back,” Spahn said. “It’s all grassroots and it’s going to happen here.” Whether the commentary aspect will be enough to draw users away from Ustream will be interesting to see in the future. Finally—starting this season, Nico Nico is entering the anime simulcasting business. 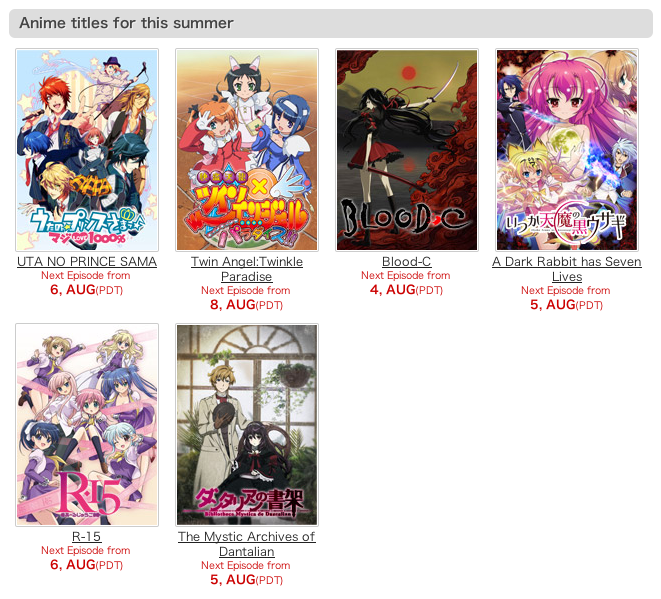 Some of their titles are available on Crunchyroll already, but they appear to have a lock on Blood-C and Uta no Prince-sama. Seeing as they are partners with Funimation—we interviewed Mr. Spahn at the Funimation booth, which is where the Nico Nico broadcast station was—Nico Nico may become a major player in the streaming business in the days to come, adding another entrant to a field dominated by only a few players now. Nico Nico seems uniquely positioned in the American anime market right now. They have come along just as the streaming revolution has taken off, shaking up the traditional, disc-based distribution model. The website is inherently social just as social sites like Facebook and Twitter, and even Youtube captions, have become the most dominant sites on the web. Nico Nico Douga has already spawned an entire fan-generated subculture among otakus, encouraging the creation of mashups and original videos with often hilarious commentary on top. Whether it will spawn a similar culture in America remains to be seen, as well as whether their model is disruptive and captivating enough to supplement or even entice users away from Youtube or Ustream. One thing is clear, though: they’re making themselves as visible as possible and if you’re a fan at a convention this year, they do not intend to be ignored. 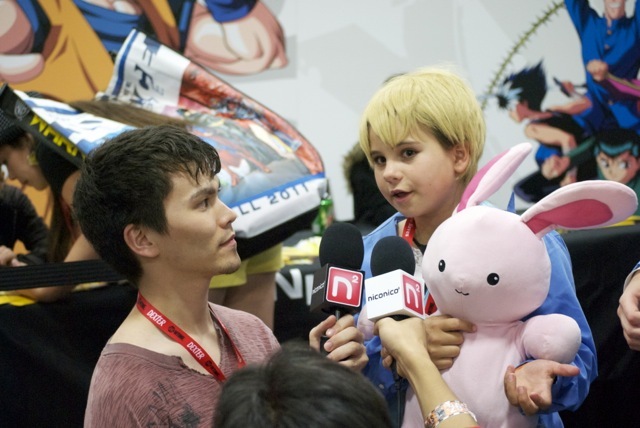 Previous PostOtakon 2011: Summing up Makoto Shinkai Experience!Next PostAnime Expo 2011 — “Skull Girls” Interview! Cool! Yeah, MAD movies are a driving force of this community based internet tube. We are doing what Marcel Duchamp couldn’t do. The most advanced ready-made art in the history of mankind! i-Dadaism! But American internet is 30 times slower than S. Korea. America needs to update its online infrastructure, on which Niconico has been flourishing because Japan’s internet is fast, before Netflix abandons disc-based distribution model and completely moves to streaming.